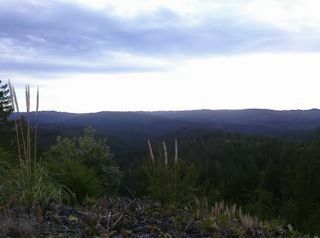 THPBlog: Humboldt Redwood Company to log on steep unstable slopes south of Kneeland, CA. Humboldt Redwood Company to log on steep unstable slopes south of Kneeland, CA. THP 1-13-055 HUM (Fresh Aire 13 THP) Humboldt Redwood Company, 268 acres; 72% group selection, 14% selection, 14% no-harvest, misc roadside logging. Little Freshwater Creek (HUM: T4N R1E Sec.24, 25, 26; T4N R2E Sec.19). Winter operations, moderate erosion hazard, steep slopes over 65%, landslide terrain, impaired 303.d watershed, coho watershed, 7 spotted owls within 1.3mi, osprey near haul road, trees up to 42" dbh. Estimated public comment deadline: 08/13/13. This THP is about 8 miles SE of Eureka, and 4 miles south of the community of Kneeland, CA at an elevation of 550 to 2338 feet. Humboldt Redwood Company is planning a tractor and cable logging operation in second growth Douglas fir, redwood and grand fir forest within the Little Freshwater Creek Watershed. The THP area drains into Freshwater Creek which flows into Humboldt Bay and is listed as impaired due to sediment and siltation. Humboldt Redwood Company owns over 96.6% of the Little Freshwater Creek Watershed which is an important fishery. There are 41 landslide terrain features in the THP area including debris slides, earth flows, dormant and active landslides. Tractors are planned for use in Unit 10 with slopes over 60% that do not flatten before reaching a watercourse, and heavy equipment is planned for use on a skid road near a class III watercourse in Unit 10. More information is available on the THP Tracking Center website.